Ginkgo Plus is the name of several different Ginkgo Biloba supplement complexes sold today. One of the most popular brands is sold by Forever Living, but other versions of this supplement are sold by Biocare and Prince of Peace. Each of these supplements uses a different blend of synergistic ingredients alongside Ginkgo Biloba. This means that the effects of these supplements will be very different and may have different degrees of efficacy for certain goals. Ginkgo Biloba is an herbal extract that has been clinically studied for its benefits for brain function, mood, energy, anti-aging, and heart health. It has been used in traditional medicine for thousands of years and is believed to improve circulation to the brain. Ginkgo is often combined with others herbs to enhance its effects. In this review of the three forms of Ginkgo Plus sold today, we will describe the ingredients found in each of these products as well as the purported benefits. Most research studies on Ginkgo biloba use have been very promising, however more research is still needed, especially large-scale double-blind placebo-controlled trials. At this time, the FDA has not approved Ginkgo biloba as a drug to prevent or treat any conditions. In the USA, Ginkgo biloba is available as a dietary supplement only. 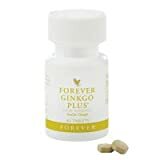 One of the most prominent Ginkgo biloba supplement brands is Forever Ginkgo Plus, sold by Forever Living. This supplement is a blend of powdered ginkgo biloba leaf, reishi mushroom extract, cured fo ti root, and schisandra chinensis berry. According to the manufacturer, this supplement is said to “increase circulation of blood to the brain, elevate mood and energy, and increase concentration, alertness, and metabolism.” It has been formulated with tonic herbs that boost the effects of Ginkgo extract. The supplement contains 30 mg of Ginkgo biloba Extract, standardized to 24% flavonoids and 6% terpenoids. This dosage is relatively low compared to other Ginkgo products on the market. A generally recommended dosage for Ginkgo is between 80 – 240 mg per day, meaning you would need to take three capsules daily to meet the lower end of the recommendation. The supplement also contains 210 mg of reishi mushroom extract. This mushroom has been called the “immortal mushroom” and is often supplemented for its anti-aging benefits. It is reported to promote blood flow and support the immune system. Gingko Plus also provides 130 mg of Schisandra Chinensis berry powder. Schisandra is considered to be an “adaptogen” that helps to improve energy, physical performance, reduce stress, and slow down signs of aging. The final ingredient in the Forever Ginkgo Plus supplement is 110 mg of Fo Ti root. This is an ancient Chinese herb, said to fight signs of aging, promote energy and boost sexual function. This supplement comes in a bottle of 60 capsules and is sold for $19.95 online. This equates to a per serving dosage of $0.33. Biocare Ginkgo Plus is a product sold exclusively in the UK. The blend contains potassium, Vitamin C, bilberry, and standardized Ginkgo biloba extract. This product is purported to aid in the maintenance of good cognitive function, reduce signs of oxidative stress, and reduce symptoms of tiredness and fatigue. It is also promoted to support the functioning of the nervous and immune system, improve cardiovascular health, and may help with mild to moderate cerebrovascular insufficiency. Biocare Ginkgo Plus contains 150 mg of Ginkgo biloba per capsules alongside 20 mg of Vitamin C, 3.5 mg of Potassium and 60 mg of Bilberry extract. The product is sold in 90 capsule bottles at a price of £24 per bottle. This is roughly equivalent to an MSRP of $37 per tub and $0.41 per serving. The recommended dosage is one capsule taken three times daily. This Ginkgo Biloba complex contains 40 mg of Ginkgo extract per serving. It also contains 100 mg of Tibetan Rhodiola Rosea, 300 mg of Eleuthero (Siberian Ginseng), and 1400 mg of Mulberry extract. The Ginkgo Biloba extract dosage found in this supplement is relatively low. The supplement is promoted as an energy-booster that may be beneficial for athletes or others who want to enhance their mental alertness and feelings of well-being. It contains a blend of adaptogens designed to increase endurance and physical performance. Eleuthero extract is another adaptogen that is commonly stacked with Ginkgo Biloba to increase energy, immunity, and promote mood balance. It is interesting that this supplement contains a high dosage of Mulberry extract. Mulberry has recently been implicated in weight loss studies. Prince of Peace Ultra Ginkgo Plus Endurance is sold in small vials of 0.33 fl oz (10cc) and each one is an individual dose. The MSRP for this product is $10.99 for thirty vials, with a cost per serving of $0.33. Ginkgo biloba has been rated by the Natural Medicines database as Likely Safe when taken orally and appropriately by adults. Ginkgo biloba is generally well tolerated with a low risk of side effects. Some minor side effects that have been reported in rare cases include nausea, headache, and gastrointestinal complaints. There are some contraindications with Ginkgo and prescription medications, over-the-counter medications, and other herbs and supplements. It is recommended that you speak with your doctor to determine if this supplement is right for you. All three of the Ginkgo Plus supplements reviewed in this article have similar goals. While the additional herbs and supplements included in each Ginkgo Plus formulation may be different, the overall effects of each are described similarly. Which supplement you choose will mostly be up to availability and your personal sensitivities. If you know that you have issues with any of the additional herbs or vitamins in any one formulation, then perhaps choose a different one. Another option is to take Ginkgo biloba on its own and build your own personalized stack with other herbs and supplements that is specified for your needs. My daughter has aged 12 years has used forever ginkgo plus for two years and currently is experiencing headache, forceful heartbeat! What can she do to get out of danger? I think she shd reduce the dosage. Or else find an alternative supplement to take care of her condition. I think she has forceful heartbeat and headache as a result of her already hyperactive nature, where her pulse is already high as a young person , unlike older adults with lower pulse rates.